4-PIECE "COLOR ID" PLIER SET. Set Includes: • Chain Nose with Spring • Semi-flush Side Cut..
Beaders Tool Set COLOR I.D. 8pcs The BEADSMITH. 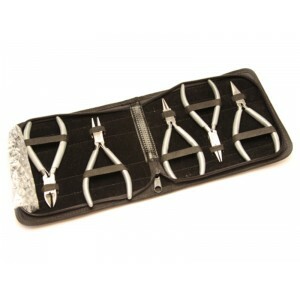 8-piece Set Includes: 3 Mini Pliers Fl..
COLOR I.D. Plier Set 3 pcs The BEADSMITH 120mm. Chain Nose Pliers. The jaws of chain nose pl..
Ergonomic Box Joint Plier Set 5pcs The BEADSMITH 125mm. Round Nose Flat Nose Cha..
Ergonomic Box Joint Super Fine Plier Set 4pcs The BEADSMITH 115mm with leatherette carry case. ..